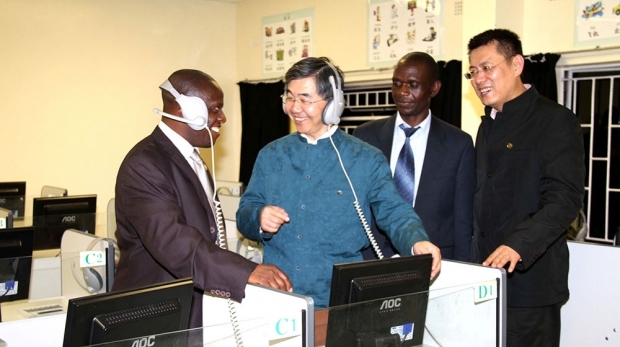 Xu Xianghong, in blue, then Head of the Chinese Delegation “Confucian Culture In Africa,” visits the classroom of the Confucius Institute at the University of Zimbabwe in Harare, October 22, 2010. The Chinese government has spent billions of dollars in Africa on public diplomacy initiatives that are intended to improve the country’s image. Central to that strategy is the growing network of Confucius Institutes (CIs) spread across the continent that are designed to introduce Chinese language and culture to the African masses. Today, there are over 40 CIs in Africa but, despite their good intentions, these institutes attract significant controversy. Goethe University post-doctoral research fellow Falk Hartig is an expert on CIs and the broader role they play in China’s cultural diplomacy overseas. Hartig joins Eric and Cobus to discuss whether cultural diplomacy is actually effective, particularly in China’s case.